Best Music Of 2012 Featured Triptych Featured best music stories. December 19, 2012  It's hard to keep track of new artists these days. So we asked our colleagues around the country to recommend recent discoveries from their communities. Download 10 songs that helped put these musicians on the map in 2012. December 5, 2012  The list of lists. 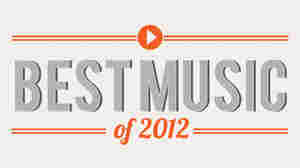 See all of NPR Music's 2012 favorites in one place.